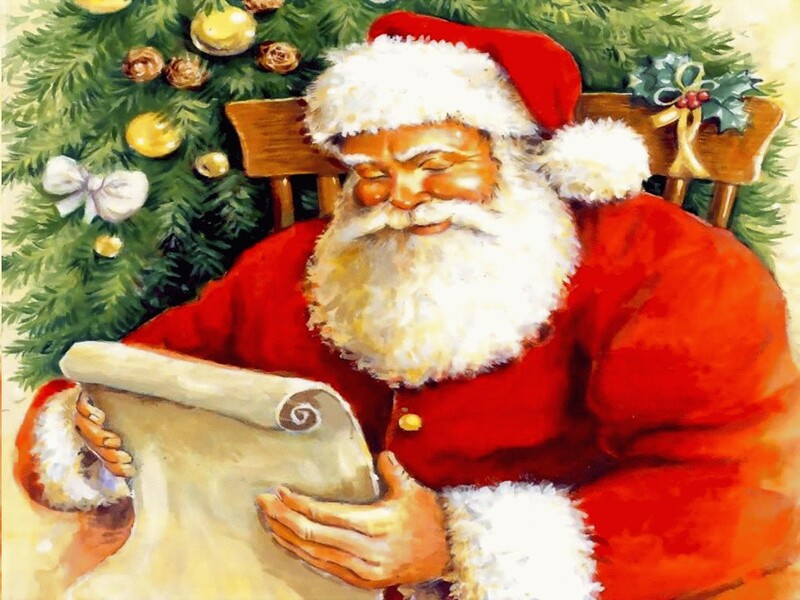 Dear Holly: There is no longer a Mrs. or, for that matter, Ms. Claus. We were divorced on June 23. My new spouse should be properly referenced as "Mr. Dwayne Claus-Rosenberg." Dear Melissa C: White Christmas isn’t about any particular race, it’s about snow you idiot. Bing Crosby is reminiscing about Christmases when he lived in a colder climate where snow, which is always white (except in highly polluted cities like Beijing), often covered the ground on December twenty-fifth. If you genuinely want to do something worthwhile this holiday season I suggest you ring bells for the Salvation Army, volunteer at a soup kitchen or bake cookies and take them to a lonely shut-in rather than expend energy trying to ban a song that evokes so much sentiment in people of all races who, unlike you, actually have the ability to think rationally. Dear AP: Bring your own food and eat that tasteless crap while everyone else in your family enjoys the traditional fare your mother was probably preparing when you were nothing more than a twinkle in your father’s eye. Dear Mr. Claus: That’s a microaggressive reply. You’re assuming I have a father. I don’t. Dear AP: I can see why he took off. We weren’t planning on doing much to observe Christmas this year until our son and daughter-in-law informed us they are flying in on Christmas Eve with our 21-month-old grandson. That jingled our bells big-time. Step one was to procure a Christmas tree. Here in south Florida, that means an artificial one. I went online to read up on fake trees (polyvinyl chloride or polyethylene? prelighted or unlighted? metal hinges or plastic? incandescent or LED bulbs?) then visited half a dozen stores to find one that ticked all my boxes. I came home with a pre-lit nine-footer sold under the Martha Stewart brand name. When I opened the box I was surprised to find something had been inserted between the top and bottom flap, a candy bar wrapper that, when I sniffed it, still smelled faintly of chocolate. It was printed in Chinese: Ms. Stewart, like every capitalist who hawks fake Christmas trees, has hers made in China. As I assembled the tree, I found myself wondering about the person who slipped that wrapper into the box. It was, I assume, the worker responsible for the final step in the manufacturing process, taping the box shut. Was that person a he or a she? Young or old? When did it happen? Last month? Last year? Did the wrapper wind up in the box because the worker was careless? Or was it placed there deliberately? Does the factory forbid workers from eating on the job and, not knowing what to do with the wrapper when a supervisor was approaching, did the worker stash it between the flaps to avoid being reprimanded? The one time I was in China, in 1996, I toured a factory that was on the itinerary of a marketing association whose annual meeting I was attending in Hong Kong. We boarded a bus, were driven over the border – Hong Kong was still British so our passports were carefully checked by armed customs officials – and taken to a fancy country club for lunch. We then visited the factory, a grey, windowless building where dozens of young women were seated at row after row of sewing machines, poking holes in the heads of cheap rubber dolls through which workers in the next room were to weave strands of plastic hair. Guards stood watch at each door, a grim reminder to the workers that they weren’t free to come and go. We were later told the majority of the factory’s employees were from northern China and had migrated south, where most of the country’s factories are located, to find jobs. In return for working 12 hours a day, six days a week and living in cramped dormitory-styled housing owned by the factory, they could earn money to send home to their families. I don’t know if conditions in Chinese factories have changed much since then – I hope so – but have always remembered the workers at that doll factory and wondered what became of them. They’re middle-aged by now. Are they still working at the same factory? If so, do they still spend 12 hours a day poking holes in rubber doll heads or have they moved on to something else? While many if not most of the presents we Americans will be unwrapping next week come from China, it’s important to keep in mind that the workers who make the smart phones, computers, toys, TVs, games and other gizmos we will be giving and getting are subjects of a totalitarian government that has little regard for them. There’s no freedom of speech, the media is strictly censored, there are few safety nets for the poor or disabled, and hundreds of thousands of children languish in orphanages because, until recently, a woman who had more than one child was subject to arrest so unplanned babies were abandoned. My niece and her husband eight years ago adopted one of those babies, a malnourished two-year-old who had been left on an orphanage doorstep. Today that little girl, who probably has the highest IQ of anyone in our extended family, lives in a big rambling house, attends church services with a former president, is enrolled in an exclusive private school, plays the violin like a pro, earns straight As, and is doted upon by parents who will always make sure she has the best of everything. Her family’s gain came at the expense of a frightened mother who may well work in a factory like the one that made our tree and will never know what happened to that baby she left on the doorstep. 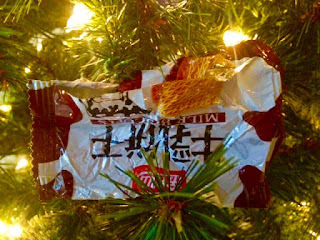 Once my wife had trimmed the tree, we added a final decoration to one of its highest boughs -- a crumpled-up Chinese candy bar wrapper that will remind us, as we watch our grandson play with his new Chinese-made toys under our Chinese-made tree on Christmas morning, how lucky we Americans are. Like this post? You can share it by clicking one of the buttons below. This column was published in the Wilton (Conn.) Villager on Dec. 14, 2000. For most people, Christmas is a time to celebrate life, the birth of a Savior. It’s time to spend with family and friends, to bask in good cheer, to count blessings. Christmas brings out the best in most people. To me, Christmas isn’t about life. It’s about death, and every year is a struggle to get through it. No violins please but my father died when I was 14. During Christmas of 1965, he was as ill as a human can be and still be classified as alive. He died shortly thereafter. My father ran a general store in a tiny Missouri town. Like many men of his generation, his work was his life and he worked six days a week, 12 hours a day. If I wanted to spend time with him, I had to be where he was. So, like my brother and sister before me, I started clerking at the store when I was eight. Every afternoon after school I would report to the store and stay until 7 p.m., closing time. Christmas was a magical time to work in a country store. Not only did we sell exotic seasonal specialties like Brazil nuts, tangerines, egg nog and satin-y ribbon-shaped candies, we were stocked to the rafters with toys and practical Midwestern type gifts – scratchy flannel shirts, stocking caps, rubber galoshes, long underwear and the like. Dryden’s Store had a large showroom window, facing the town’s block-long main street. My father let me decorate it each year, and it was the highlight of my holiday. First I built a fireplace out of cardboard bricks. 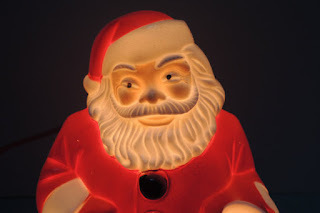 From the mantel I hung long stockings filled with nuts and candy canes. Around the cardboard hearth I placed empty boxes, wrapped in colorful paper and topped with curlicued bows made by the lady salesclerks. 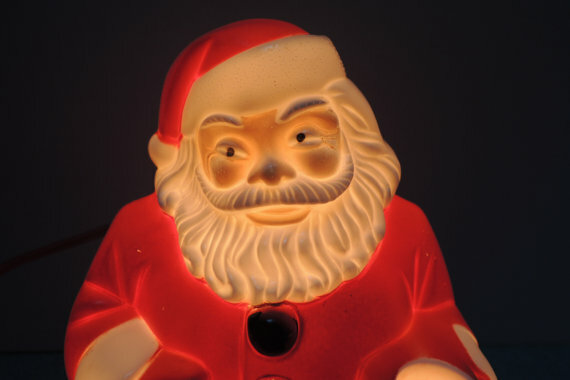 A plastic lighted three-foot Santa was stationed next to the fireplace. Strings of bubble lights draped with tinfoil icicles were tacked around the perimeter of the window. For my grand finale I always wrote “samX yrreM” in spray snow on the inside of the plate glass window, so people driving by could read it properly. It was, in retrospect, as tacky as all get-out, but I was proud and dad always told customers it was my work. My father was diagnosed with cancer just before Christmas, 1964, but nobody told me it was terminal. I knew he had undergone surgery in a St. Louis hospital, that he had lost weight, that his color was bad. But I was 13 and, as 13-year olds do, assumed the worst was over and things would return to normal. I was wrong. Throughout 1965, his cough grew worse, he grew weaker and thinner. My mother, who had never worked outside the house a day in her life, took over the operations of the store. It was our tradition – the only time of the year outside his work that my father and I spent time together – that on the Sunday before Christmas, we would go to a farm a mile south of town and chop down a cedar tree for our living room. But as Christmas 1965 grew nearer, there was no talk of a tree, decorations or of holiday plans. One snowy night a few days before Christmas, I went to the farm, chopped down a tree, and dragged it home on my sled. When I called my mother out into the garage to see what I had brought home, she broke down weeping and told me there would be no Christmas because my father was going to die, and soon. I had no idea. And I still have no other memories of that, my father's last Christmas. I know this column may seem inappropriate at this happy time of year, even ludicrous. Here I am, a grown man with his own family, bellyaching about something that happened decades ago. I know people who have experienced losses far more profound than mine. Death is a part of life. I should have been able to get over it by now. But losing a parent, as more and more of my middle-aged friends have found out lately, is something that’s hard to get over. Losing a parent at Christmas, when you’re 14, is enough to take away the wonder and joy of the holiday forever. I made my annual holiday shopping trip to the mall today. In the atrium, carolers were singing “Auld Lang Syne,” the song the townspeople sing at the end of It’s a Wonderful Life, the movie that reminds me of my father. I had to leave the mall, go sit in my car, and beat up on myself for being such a wuss, for feeling so sad when everyone around me seems so joyful. I want to feel joyful too but, dammit, I can’t. And I’m not the only one. Mental health professionals report that millions of otherwise well-adjusted people plunge into funks at Christmastime. I bet a huge percentage of them lost loved ones at Christmas, the one time of year when everyone is supposed to be happy. For them, their wounds are ripped open anew every year the day after Thanksgiving and continue to bleed until New Year’s Day when the tree is taken down and the decorations are put away. For most of the year I’m an upbeat kind of guy. But not at Christmas. And I want those of you who feel like me to know you’re not alone, and you’re not crazy. I understand how tough it is to keep a happy face when everyone is singing about merry gentlemen and triumph in the skies and all you really want for Christmas is something you can’t have: To be once again – for one blessed moment – a boy writing “samX yerryM” in spray snow on the window of your father’s store, secure in the knowledge you’ll actually have one. Postscript: I was 49 when I wrote the above column. Well, it’s 15 years later. I’m older and, supposedly, wiser. My sons are grown. My 20-month old grandson, the joy of our lives, will be arriving at our house on Christmas Eve. I suspect Santa will be generous with him. Of all the columns I’ve ever written, "samX yrreM" generated the most response. I received dozens of emails, letters and calls from readers who said they felt the same way about Christmas as I do, and for the same reason – the loss of a loved one at, as the song goes, "the most wonderful time of the year." I still don’t like Christmas – Thanksgiving, the Fourth of July, even Labor Day give me more pleasure – but writing this column helped me work through it, and I’ve made a concentrated effort ever since not to let Christmas get me down. I realized it wasn’t fair to my wife and children, who had no reason to dislike the holiday, to wear my heart on my sleeve. That said, I can’t wait until New Year’s Day. I woke up craving my mother’s biscuits. Of course I wanted one or, more often than not, six or seven. Ruby’s biscuit was/were sublime. She said her mother, my grandma Judy (not to be confused with my wife Judy or sister Judy), got up early every morning to make a fresh batch. Mom used her mother’s recipe. Ruby had a way with bread – white, wheat and French (which she started making in her nineties after she got her Kitchen-Aid mixer). Her loaf bread was excellent but her light rolls were out-and-out ethereal. All her descendants dreaded the day she would be gone and we’d never be able to taste them again. We begged her to write down her recipe but she wouldn’t, claiming she had been “keeping house” for 80 years and that the one thing she had learned over the years was that it was necessary to vary the amounts of the ingredients depending on how the yeast reacted with them. One of my nieces actually made a video and followed Ruby around the kitchen as she explained how much of everything she used, but then started throwing in a little more of this and a little less of that and talking about the size of yeast bubbles and how the warmth of the water to use depended on the weather outside, so she gave up. 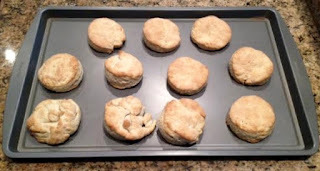 I would never attempt to replicate mom’s yeast breads, but it occurred to me this morning that I might be able to make biscuit so I went online looking for recipes. Many of them promised buttery, flakey biscuit which is, apparently, the criteria by which food critics judge them. Ruby’s were neither. Hers were dense and flour-y, and she didn’t use butter, she used lard (and, after her open-heart surgery at 85, Crisco). She would mix the dough by hand, roll it out, knead it with the balls of her hand, turning the dough as she went, then cut out the individual biscuit into circles using a juice glass. I finally found a recipe at bettycrocker.com that promised nothing heroic and seemed straightforward, something even I could make. Amazingly, we had the ingredients on hand. So, I made a batch of biscuit. They turned out OK – as my great uncle Forrest who was born in the 1880s would say, “tolerable” – but not great, and certainly nothing like mom’s. They were even a bit flakey. Ruby would be proud I tried but, I can hear her now, she’d say she knew before I started that mine couldn’t possibly have turned out as good as her biscuit because, after all, I haven’t been keeping house for 80 years. This is the fifth in my series of exclusive interviews with candidates running for president. See Blog Archive (scroll down on right side) for interviews with previous subjects including Donald Trump, Hillary Clinton, Lincoln Chafee (who dropped out of the race following our interview) and Jeb Bush. TD: Though you’re running for the Democratic nomination, you make no bones about it – you’re first and foremost a Socialist. Who is your role model? TD: Your Brooklyn accent comes as a surprise to many who hear you speak for the first time. How’d a Brooklyn guy wind up representing Vermont? BS: You gotta prawblem wit Brooklyn? TD: Let’s change the subject. You go on and on about the importance of paid family leave but say very little about Isis. What would you do to keep us safe from them? BS: Oy-sis isn’t our numba one prawblem, the numba one issue is that new muthas and fathas are being foist to go back to woik to suppoet their babies. Next question. TD: How are we going to fund paid family leave? BS: We’ll plant more trees. Money grows on trees. We'll take that money and use it to pay women, men and transgendahs who become new parents. 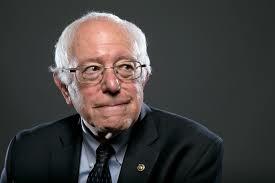 TD: What did the Clinton campaign, knowing there wasn’t a snowball’s chance in hell a Socialist could win, promise you in return for running and enabling Hillary to give the illusion she actually had to fight for the nomination? BS: Oy got nuttin’ to say about dat. Noise tawking witch chew.